When makeup and beauty YouTuber Em Ford (My Pale Skin) posted photos of her makeup-free face on social media a few months ago, the unimaginable happened. People commented with horrible responses such as "Seriously...has she ever washed her face?" and "Ugly as f*ck." When she covered up her blemishes with makeup, the responses were positive at first and people praised her with comments such as, "You're so pretty," and "You look amazing." But the compliments were quickly followed up with remarks like "This is why I have trust issues," and, "Imagine waking up next to her in the morning." Perhaps the saddest comments were those from others struggling with the same skin issues and insecurity, and who had experienced similar bullying. "I wanted to kill myself," one commenter said. 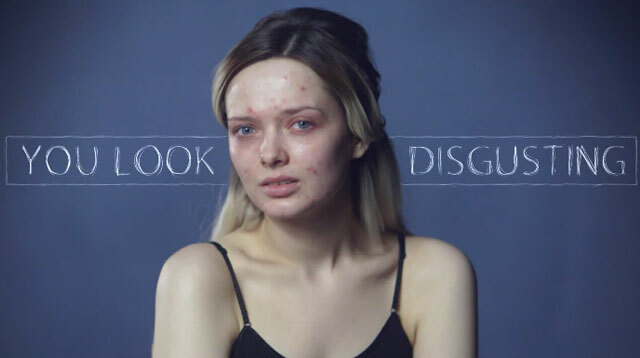 The powerful video above shows not only how harmful social media can be to a person's self-esteem, but also how impossible it is to meet other people's expectations for you (especially if the feedback you're getting is on the Internet). If a gorgeous YouTube beauty blogger could get this kind of response over her bare face, why should any other young women feel comfortable in her own skin? Em ends the video with a quote: "You are beautiful. Don't let anyone tell you differently. Not even yourself." And that is how you fight the haters.